These renderings of the universal terrestrial dwelling are an attempt to find a better way of linking the ellipsoidal activity-space envelopes together in a smooth and aesthetically pleasing way, which also provides adequately shaped conduits for passing between the spaces. 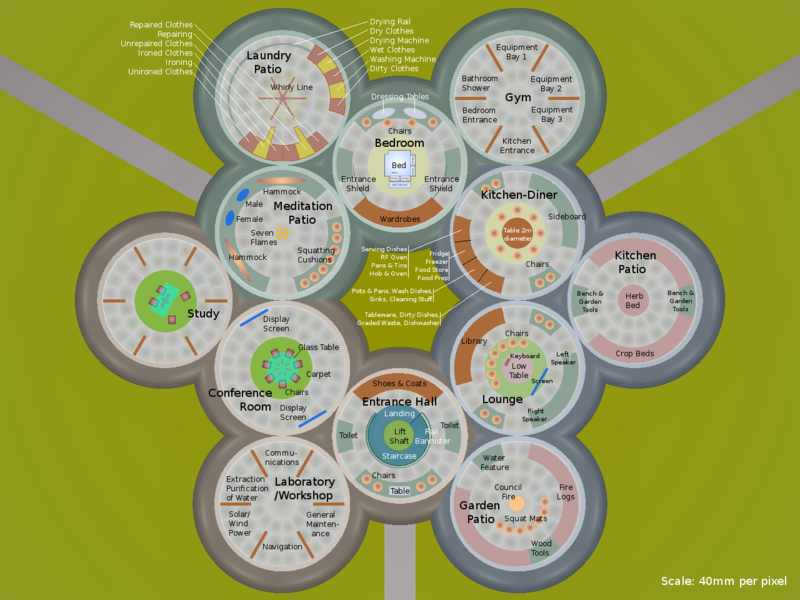 This version of the dwelling comprises 12 ellips­oidal activity-space envelopes or shells. These accommodate the various human activities that the dwelling must support. These 12 shells are arranged in a snowflake pattern. 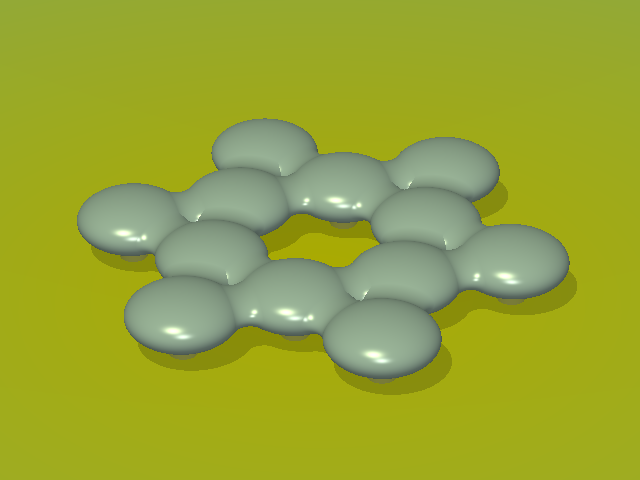 This comprises a circle of 6 touching shells, arranged so that their centres fall on the points of a hexagon. The remaining 6 shells are then placed around the outside of the first 6 such that each outer shell touches two inner shells. The ellipsoidal shells are then moved radially towards the centre of the dwelling so that they partially merge into each other. Each shell is moved inwards a distance that is proportional to (a prescribed fraction of) its original distance from the centre. Each shell thus merges with its neighbours by an amount such that an elliptical aperture or doorway appears between them. 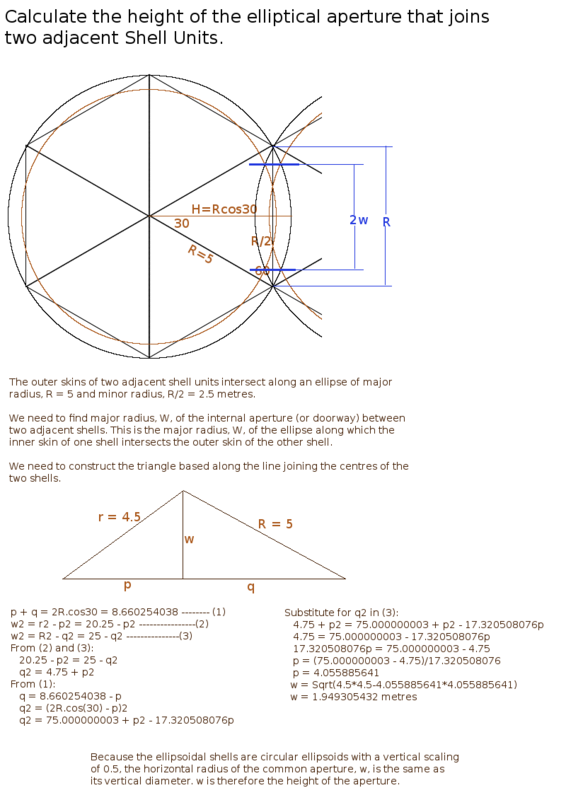 It is necessary to calculate the height of the elliptical aperture between two adjacent shell units to leave ad­equate height for a human occupant to pass through it. 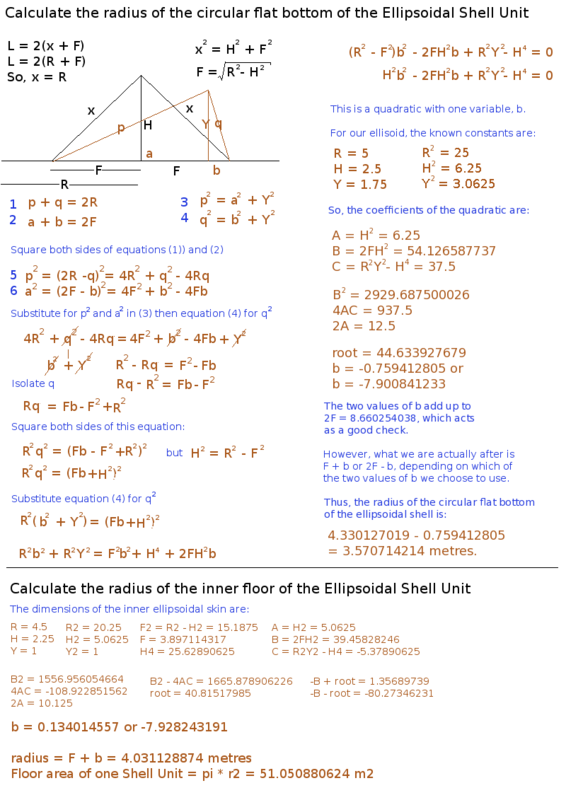 The major radius of the ellipsoidal shell is then calculated to give an inter-shell ap­erture height of about 2 metres. The ellipsoidal shells are of two forms, as shown in the daytime view of the dwelling above on the right. 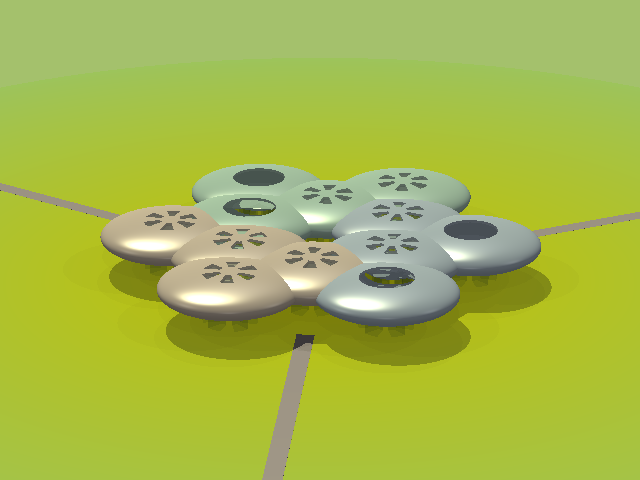 The enclosed form, for normal activity spaces, has a wheel of 6 skylights around its top centre. The open form, for patio spaces, has a 4-metre diameter hole cut out of its roof. The night-time view, shown on the immediate right, better illustrates the interconnected internal activity spaces of the dwelling. 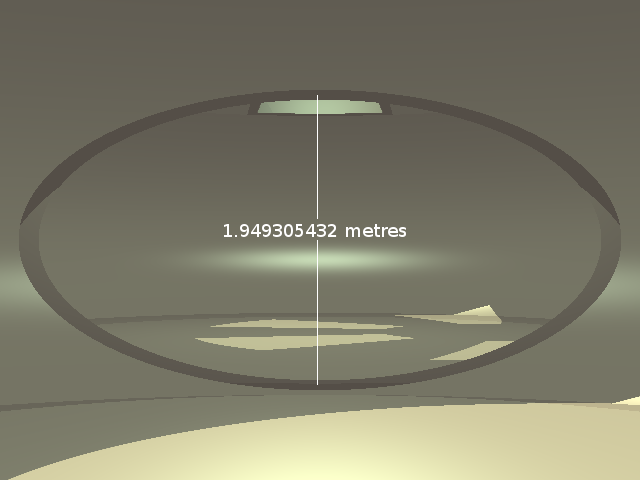 The floor level of each activity-space is 3 met­res above ground level and 1 metre below the horizontal centre plane of its ellipsoidal enve­lope. The view on the right shows the whole dwelling sliced off at the horizontal centre plane of its ellipsoidal shells. The three colours indi­cate the activity spaces associated with the three different activity-classes: work, rest and play. Each shell is supported on 6 transparent pillars to raise the floor to the correct level. 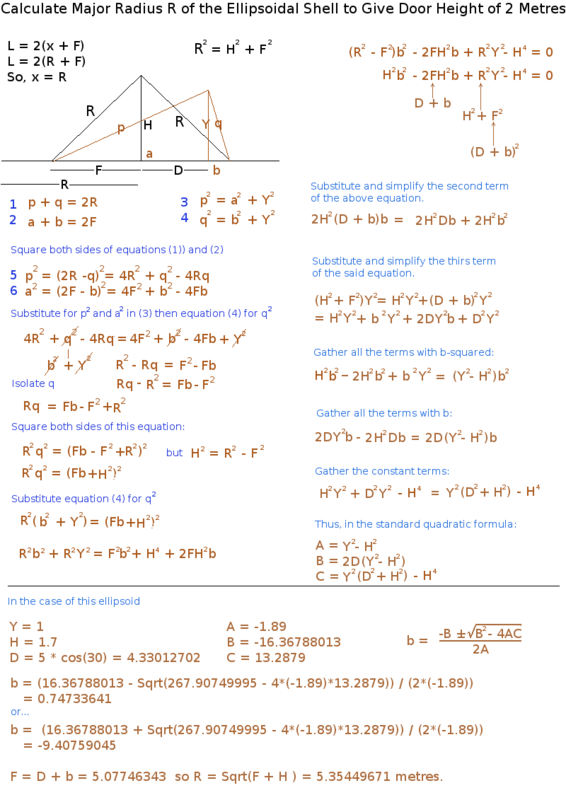 The geometry for calculating the radii of the floors and the circular flat bottoms of the dwelling's ellipsoidal shells is given here. 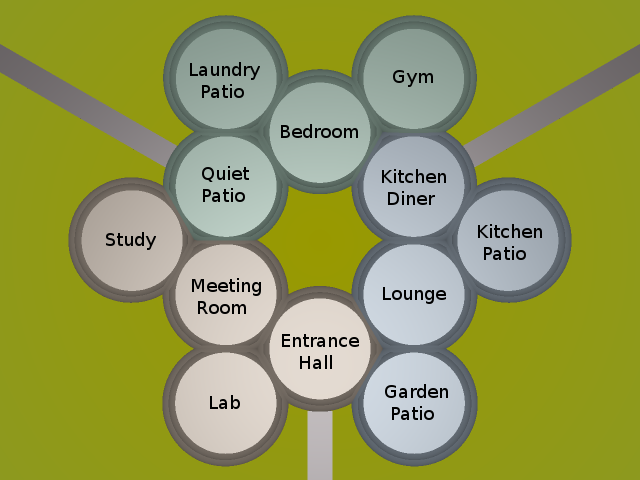 A detailed activity analysis of the life-style of the occupants of a landshare farmlet suggested the allocation of activities to the available spaces shown on the right. 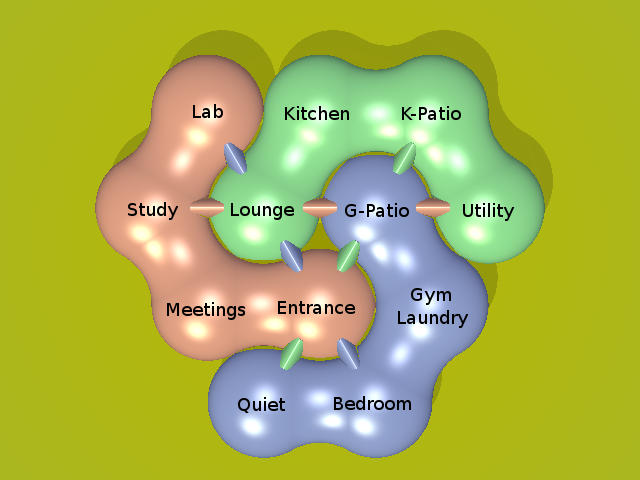 An in-depth design, content and layout of these activity spaces for the whole dwelling is given in this diagram. This arrangement is not, however, cast in stone. It is very flexible and may be adapted easily to the particular preferences of each individual family group. The variant on the left was formed simply by increasing the horizontal radius of the ellips­oidal envelope by a factor of 1·1 without alter­ing their relative positions. The increased merg­ing of the shells creates higher and wider acc­ess apertures between the activity spaces. 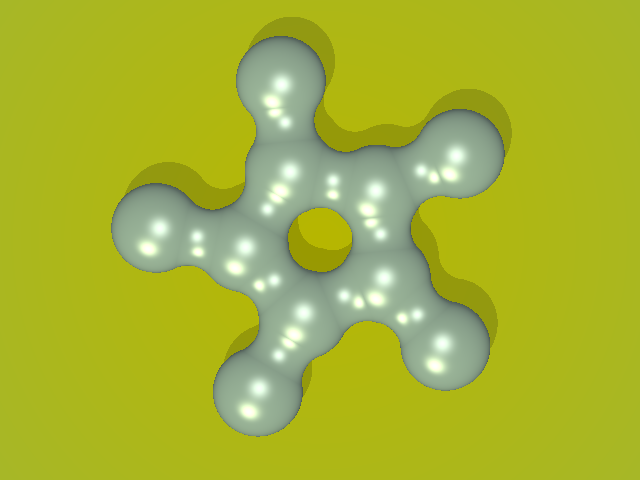 The two variants of the ellipsoidal dwelling, so far described, were generated using the POVray ray-tracer with the program ellipsoids.pov. The one great shortcoming of the above arran­gement of ellipsoidal envelopes is the simple merged linkage between them. The ellipsoids have to be merged far too much in order to achieve the minimum adequate aperture of passage between them. I sought to overcome this shortcoming by forming a connecting corri­dor. This has the shape of a horizontal trunc­ated central section of a torus, which forms a seamless neck between every adjacent pair of ellipsoids. In this case, the ellipsoids are not pushed to­gether radially as in the merged version previ­ously described. To acquire sufficient headroom inside the connecting corridors, it is necessary to greatly increase the overall size of the ellip­soidal shells. For this reason, their bottoms are no longer flattened and they rest on the grou­nd, not on pillars. There is also a very low limit on corridor size to be able to fit them in a tri­angle as required. In an attempt to acquire the necessary head­room in the corridors, I tried merging in an elli­ptical cylinder as shown installed in the dwelling on the right. Although I pursued this idea in later designs, I have never been happy with its appearance from an aesthetic point of view. 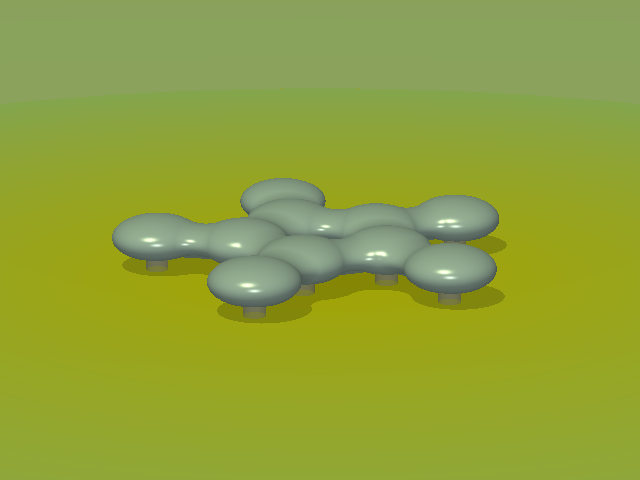 Variants based on this version of the universal terrestrial dwelling may be created using the POVray ray-tracer program globules.pov. 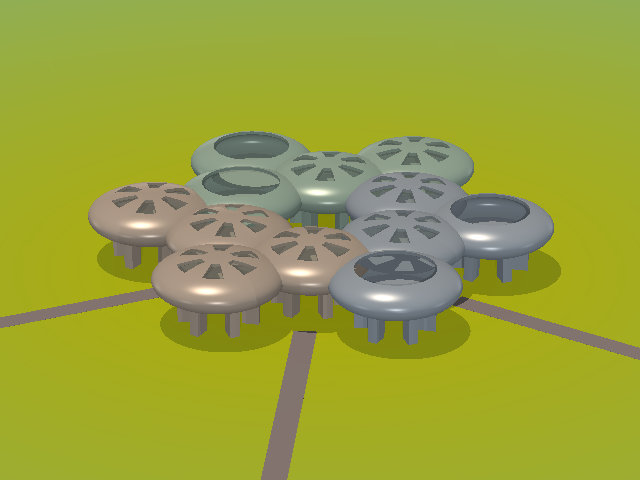 To try to relieve the congestion of adjacent cor­ridors, and create space for wider inter-shell apertures, I experimented with the design on the left. This comprises only ten ellipsoidal shells. 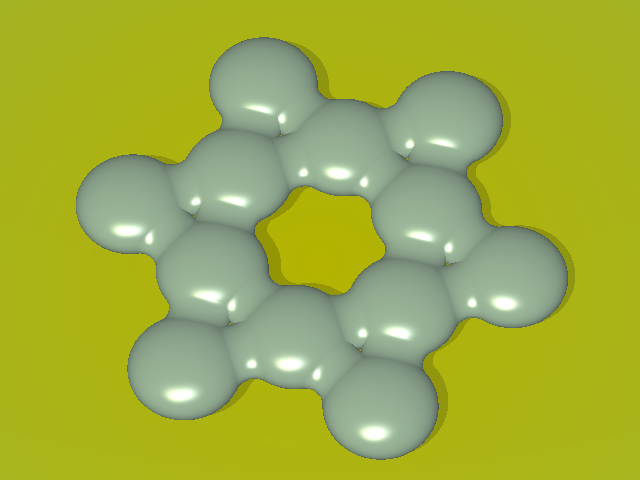 The 5 inner shells are arranged such that their mid points lie on a horizontal pentagon. And rather than joining each of the 5 outer shells to two of the inner shells, I opt to join them each to just one. The dwelling thus takes the form of a kind of pentagonal galaxy. The interconnecting corridors can now be much wider but the overall number of activity spaces available has been reduced to ten. Because I could, once again, keep the ellipsoidal envelo­pes down to a smaller diameter, I used trans­parent elevation pillars to effectively raise the inner floor level to 3 metres above the ground. For the formal geometry for this variant of the dwelling please see pentaglob-geometry.png. With the extra angular space afforded by the galaxy arrangement, I tried increasing the num­ber of activity spaces to 14 by going up to a 7-point (or heptagonal) galaxy in which the mid-point of each ellipsoid lies on a heptagon (7-sided regular shape). With this version, I also engaged in some exotic colouring experiments. 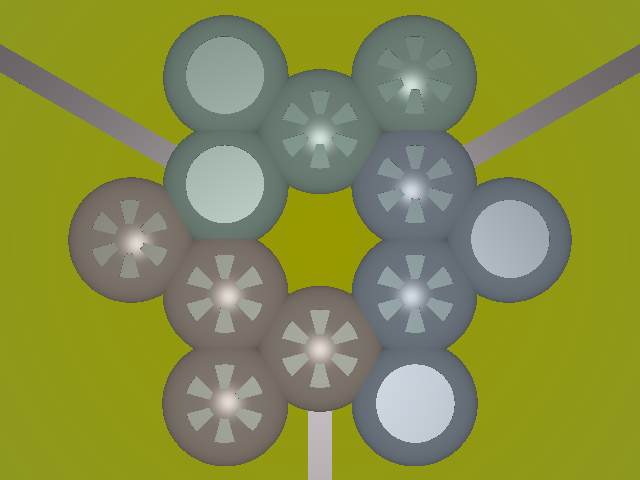 The pentagonal and heptagonal galaxy versions of the dwelling are also generated using the program globules.pov. With this design, the principle of linking ellipso­idal shells seamlessly by torus-section corridors is continued. 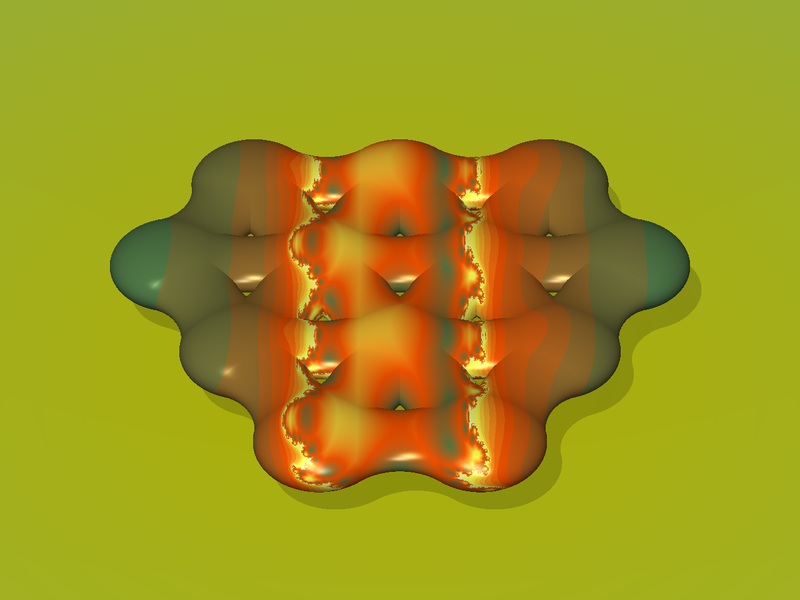 The way in which the activity sp­aces are arranged relative to each other is, however, quite different. The effect is that the universal terrestrial dwelling adopts the shape of a triangle with each apex truncated (chopp­ed off). The dwelling thus looks more compact and much more vehicular in appearance. In the plan view on the left, I have labelled each shell with the activity it hosts according to my activity analysis exercise. 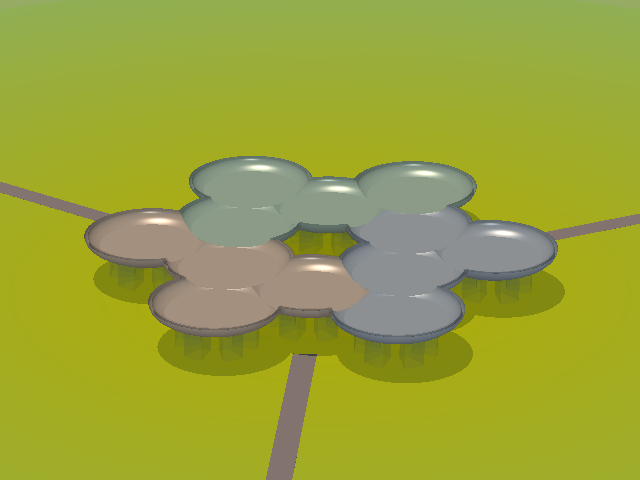 The groups of shells, supporting each class of activity (work, rest, play), are shown in different colours. 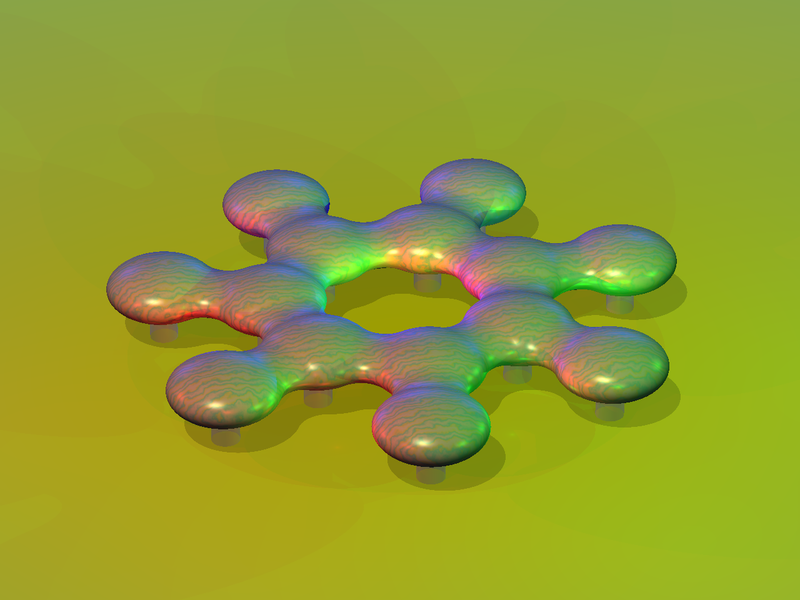 The shells within a class are linked by wide seamless torus section corridors. 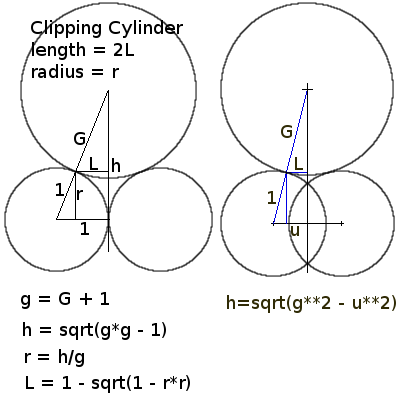 Inter-class access is by narr­ow elliptical cylinders. This gives the dwelling the appearance of 3 interlocked cashew nuts. The POVray program used to generate this version of the dwelling is in the file triangle1.pov.